Paris, France’s capital, might just be the most popular destination in Europe and I’m pretty sure that a visit to this wondrous city has been or is in your travel bucket list — it has certainly been on mine. I first landed in Paris in 2013 and up till now, I can still remember its utter magnificence! However… as one of the global centers for art, culture, fashion, and gastronomy, I can understand how it can be such a dizzying ordeal to plan out an itinerary in Paris. So in order to lessen your ‘load’, I will be giving you the highlights of this vast metropolis that you must absolutely see and do — but to make this deal even better, given how Paris is known to be one of the most expensive cities in the world, I’d also like to prove that your trip doesn’t really need to be pricey at all because there are various things that you can do without spending. So with this, I present to you the top 10 FREE things to do in Paris, the esteemed city of love and lights! I bet that you’ve seen this coming! 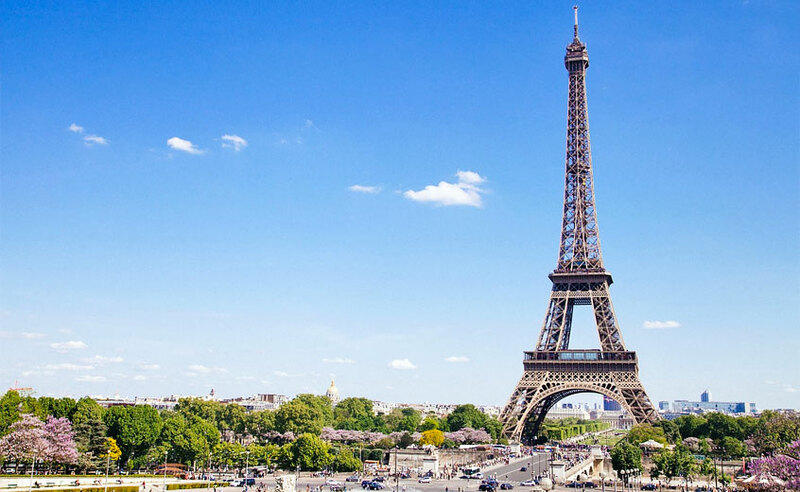 But well of course, a trip to Paris will never be complete if you don’t take the time to visit the Eiffel Tower (La tour Eiffel) — though surely… how could anyone miss it? It sticks out like a sore thumb in Champ de Mars and it is the highest structure in the city! TRIVIA: Standing at 324m high, the Eiffel Tower was supposed to be a temporary exhibit during the 1889 World Fair, functioning as an entrance arch to the event. But due to its popularity, it was never taken down. Today, it is the most-visited paid monument in the world named after Alexandre Gustave Eiffel, an engineer whose company designed and built this tower. Personally, knowing this fact had amazed me because it’s similar to the story of Brussels’ famous Atomium structure which was also built during a World Fair and was not intended to last long; but since everybody liked it, it remains to stand today much like the Eiffel Tower. It’s absolutely free to see the Eiffel Tower (either from Parc du Champ de Mars, Place du Trocadéro, Montparnasse Tower and others). Though if you really want to experience climbing it, you will have to pay. To add, you have to be aware that the lines can get very long — remember, it IS the world’s most-visited paid monument! Now, I haven’t tried climbing it myself but I know that the entrance ticket to the top is priced at €15 for adults (if you want to avoid long ticket queues, do book your ticket online.) The tower has 3 levels: eating places on the 1st and 2nd levels and the observatory platform at the 3rd level. You can climb the stairs to the top, but typically, they close those off and make visitors use the lift (hence the reason for the long lines). TIP: You don’t really have to go high up the tower because lounging by the park of Champ de Mars as you enjoy the view is already a rewarding experience in my opinion. To make the most of it, I suggest that you do a small picnic there: bring some food, wine, and a blanket! And if you have the time, stay up until dusk because it is in those moments that the Eiffel Tower truly transforms into a breathtaking structure. (They do a light show come night time). Yes, two! There’s the well-known Arc de Triomphe de l’Étoile in Place Charles de Gaulle near Champs-Élysées and the lesser-known Arc de Triomphe du Carrousel near the Louvre Museum. Standing in the center of the Étoile (‘star’) roundabout, this 1836 monument was built in order to honor those who have fought and died for France during the French Revolutionary and the Napoleonic Wars. If you stand under this arc, you will see all the names of the French victories and generals inscribed on the inner and outer surfaces. Another notable thing as well is that the ‘Tomb of the Unknown Soldier’ is placed beneath this arc as a tribute to the 1.3 million French unidentified soldiers who lost their lives during World War I. » It is possible to go up the arc but that comes with a fee wherein ticket prices are at €9.50 for adults (children are free to come in). Half the size to its eastern counterpoint Arc de Triomphe and located near the Louvre Museum, this Arc de Triomphe du Carrousel was completed in 1808 in order to commemorate Napoleon’s military victories in 1805. A backdrop to the Palais du Luxembourg, this was built in the 1620s for Marie de Médici, Henri IV’s consort, and is the 2nd largest city park in Paris. Today, you will find here a lot of delightful things: modern playgrounds, game venues, orchards, fountains, statues, and ponds among many others! I’ve already mentioned this in #1 as it is the garden that’s right in front of the Eiffel Tower. This used to be a parade ground for the 18th-century École Militaire, but today it is now a grassy place where you can have picnics with your friends! Measuring at 8.64 hectares, it is the largest square in Paris and a park that you should definitely visit! It has a grim history (that of being an execution ground for famous people like Louis XVI, Marie Antoinette and others) but after the Reign of Terror, it became a place of peace and harmony. In the center you will find the Obelisk which is in itself a giant Egyptian obelisk which was a gift given by the Egyptian government to France during the 19th century. Located in the Marais district, it is the oldest square in Paris but one of the finest! This place may be small but it is very charming given the striking elegant 36 symmetrical houses that surround it. It is also one of the places where you will rarely see throngs of people so this can be quite a tranquil spot for you. This is Paris’ steepest park and if you don’t mind the exercise, I advise that you see this place for yourself! With its designed landscape, you will find here a lake, an island (with a temple to Sybil), waterfalls, rocky cliffs, and grottoes. A lesser-known park for tourists in Paris, this area holds a lot of beauty and history! Must-sees here are the follies or scaled-down building models from different ages and continents: a classical Roman colonnade, the an Egyptian Pyramid, a Chinese fort, a Dutch Windmill and more. Built 3 storeys above ground, this is a tree-lined garden walkway that was built on an old railway line east of Paris and interlaced with staircases, viaducts, and streets. You will also find that this passes trough Viaduc des Arts, a bridge wherein its arches are now transformed into galleries. #4 – Take advantage of FREE entry to museums! To see a complete list of museums under each of these types, go to this page. TIP: Not a lot of people know about these free schedules; in fact, what most tourists only know about is the ‘Free on 1st Sunday of the Month’ scheme. Anyhow, it’s always best to be cautious because given how it’s free, the number of visitors could be larger than normal! Therefore, I advice that you try to come to the museums either very early or very late in order to avoid the crowd. (Though if you don’t mind paying, you can always purchase the ‘Paris Museum Pass’ at 42€ for 2 days which gives you the chance to enter any museum without queuing). Metro stop: Palais Royal-Musée du Louvre. Tour: Book here for a guided skip-the-line tour to Louvre! Containing the largest collection of impressionist and post-impressionist masterpieces in the world, you will see here the works of Van Gogh, Monet, Pissaro, and many other renowned artists worldwide. TRIVIA: The building was originally a railway station, Gare d’Orsay, which is actually an art piece in itself! You should absolutely see this place. Dedicated to Modern and Contemporary art of the 20th and 21st centuries, these 2 museums includes spectacular pieces. The building structure is also a marvelous work of art! TIP: Near Petit Palais, pass by the Grand Palais too which is an impressive exhibition hall. #5 – Catch a FREE event for music, fashion, and more! Galeries Lafayette is an upmarket department store in Paris that is aesthetically breathtaking! In here, it’s possible to get a taste of the city’s fashion scene since every Friday afternoon (3PM), they showcase a free fashion show of professional models as they market the store’s collection. To be able to attend this event, you just need to confirm or ‘book’ your seat in advance by sending them an email at: [email protected], calling their number +33 1 42 82 30 25, or head to the Welcome Desk of Galeries Lafayette to inquire. One of Paris’ beautiful Gothic churches, Église St-Eustache holds free organ concerts every Sunday at 5:30PM. Truth be told, their organ here is said to be one of the biggest in the world with over 8,000 pipies! To see a complete list of free cultural events around Paris, come check out this page! NOTE: If you rather have the money to spare and are in the mood for a night out in a true Parisian opera house, come check out Palais Garnier, a 1,979-seat opera house which was built from 1861 to 1875 for the Paris Opera. You should definitely try a night stroll too! Otherwise, you can always pick a spot where you can have a picnic, or a nearby cafe where you can have a snack. Spend the time ‘crowd watching’, or just simply bask away in the atmosphere of Paris and its residents. We’ve all heard of the Love Lock Bridge in Pont des Arts near the Louvre Museum where couples put locks on the rails, after which they will throw the keys to the river as a sign of their ‘eternal’ love. However, the authorities have taken the steps to take these down — which is for good reason! You can still see some leftover locks here and there though. Anyhow, you shouldn’t fret because Paris will remain to be a city of love. You will not only see this through the French people and tourists on the streets but also through the numerous romantic places that Paris is adorned with. But if you really want to see a Parisian place that’s akin to the Love Lock Bridge, head over to the Wall of Love (or Love Wall)! I bet that most of you haven’t heard of this! Located in the Jehan Rictus garden square of Montmartre, the ‘Love Wall’ is a mural that features hundreds of ‘I Love You’ phrases in all the different languages in the world. (Tourists typically search for the phrase that is in their language so that they can take a picture with it). NOTE: If you’re a fan of Inception (the movie), head over to Pont de Bir-Hakeim which is a bridge that crosses the Seine River. Though the movie wasn’t really that ‘romantic’, this place can be a dreamy spot of its own! This might be a ‘grim’ tour for some of you, but if you’re interested, there are these two cemeteries that are famous in Paris (and even around the world!) given how they have become the final resting places of several well-known people worldwide in arts, music, and more. Think about it… this could be the closest that you can get with some of the individuals that have made a name in history! With over 70,000 tombs, most of which are elegantly-designed, the most-visited ones are those of Oscar Wilde, Edith Piaf, Jim Morrison, Chopin, Proust, etc. etc. (You can pick up a cemetery map at the conservation office near the entrance). Paris’ second largest cemetery, in here you will find hundreds of eminent Parisians that have been laid to rest. Some of those that you will find here are the writer couple Jean-Paul Sartre and Simone de Beauvoir, playwriter Samuel Beckett, and singer Serge Gainsbourg among many others! NOTE: The Catacombs or Les Catacombes is the popular underground ossuary or resting place in the city that holds about 6 million French people (skulls and bones) and 2 kilometers long. This is a paid tour at €8 (for adults) and the wait can get long. But if you have the money and time to spare, it’s quite an interesting escapade. Situated near the Arc de Triomphe, strolling through this tree-lined avenue is a MUST on your itinerary! It is over 1.9 kilometers long filled with various cafes, luxury shops, and theaters — this is also where the Tour de France typically holds its final sprint and where the military parade is held during Bastille Day. TRIVIA: Its name is French for Elysian Fields which is ‘heaven’ for dead heroes in Greek mythology. With its golden hues and breathtaking glass and steel dome, this is a department store that could act like a landmark in itself! In here you can find various luxury stores, restaurants, cafes and many others for your window-shopping fancy. TIP: Though not as ‘stylish’ as the two shopping places above, Shakespeare & Co. can be a literary-lovers’ paradise! Previously a gathering place for writers in the 1920s (to people like Ernest Hemingway and others), today, it functions as a regular bookstore, a second-hand bookstore, a reading library, and a budding writer’s haven. I say this because it is said that this place turns into a sleeping place for any struggling writer (and in exchange, they are just expected to help out in the bookstore). A masterpiece of Gothic architecture in France, this is a historical cathedral that you shouldn’t miss! It helps to note that cathedrals are different from churches since for example, it is in this Notre-Dame cathedral where you can find the official chair (cathedra) of the archbishop of Paris. Now if you have the money to spare (typically €8.50 for adults) you can enter the cathedral and climb up its North Tower wherein you can see a good view of Paris’ cityscape and the cathedral’s iconic gargoyles! But a view from outside is already enough; for the best view, go and sit at the park behind the cathedral that is called as Square Jean XXIII. Dedicated to the Sacred Heart of Jesus, this basilica is located at the summit of Montmartre which is the highest point in the city. For €6 (adults) you can go inside and up to the basilica’s dome wherein you can enjoy a panoramic view of Paris. If not, lounging around the grassy area by the 234 steps or strolling around the artsy neighborhood is a rewarding experience in itself. Styled like a massive Greek temple, this was initially made in honor of the glory done by Napoleon’s army. Today, it stands as a church where classical concerts are regularly held. TIP: Go up the staircase to witness a Parisian panorama, and the best thing about it? Entry here is for free! EAT cheap or for FREE in Paris! This might sound too good to be true, but I kid you not — you CAN get a meal in Paris without paying anything! As long as you time your visit well, you can often get a free meal as long as you buy a drink first. For example, restaurants like Le Bouillon Belge, Le Grenier, Le Tribal Café and Les Trois Frères serve a free dish once or twice a week to its customers. For more information about this, go to this page. Called as the artist’s district, you will see here a lot of interesting shops and boutiques; but of course, you will also see a lot of great French eateries to satisfy your cravings! Filled with educational institutions, it follows that the Latin Quarter is known for its student life — as they are the district’s common clientele, you can expect that most of the bistros and restaurants here can be well within your budget. A vast flea market, it is said that it could be Europe’s largest! Apart from the various stalls full of clothing and things, you will also find food and quaint specialties to be offered. In here, you will find all the fineset staples of French cuisine: wine, meat, cheese, chocolate, pastries, charcuterie and more! Explore the modern side of Paris! Although it is not officially a part of Paris, La Défense is a wonder of its own that you should absolutely see! Just west of the city, this is a major business district that is more modern and speckled with skyscrapers with interesting architectural styles and monuments. For example, its Grande Arche de la Défense is a 20th century version of Arc de Triomphe, but instead of dedicating it to military victories like the latter, the Grande Arche is a monument that is for humanity and humanitarian ideals. Also, in line with Paris’ ‘Historical Axis’, it is positioned in a way that it faces against the Arc de Triomphe because if you stand from this point, you will clearly see the arc and Champs-Élysées in the distance. So in a sense, this is the 3rd arch in Paris! Where to get the best flight deals to Paris? My go-to platform for grabbing the best flight deals is Skyscanner. But of course, it’s always good practice to first research the budget airlines that exist in the country that you’re currently staying in because they could have rock-bottom prices that are not often visible in the above flight search engines. FYI: Paris is served by 3 international airports, namely Charles de Gaulle International Airport (Roissy ; CDG), Orly International Airport (ORY), and Beauvais (BVA) — with CDG being the most popular one. By foot. One of the best things about Paris is that it’s a great pleasure to explore it by foot; after all, most attractions are not too far for one another and it makes for great opportunities to see sights along the way that you wouldn’t normally see under the metro subway. By metro. Paris has an excellent underground train system called as the Métro (short for Chemin de fer métropolitain, Metropolitan Railway) in which most entrances are marked either with a large “M” or by one of Hector Guimard’s ‘Art Nouveau’ station entrances. For buying tickets, all metro stations have both ticket windows and vending machines (take note that the latter usually only accepts coins or European credit cards with a pin-encoded chip on front). A single ticket costs €1.90 but you can also buy tourist passes that span for 1, 2, 3 and 5 days. By bicycle or scooter. This is certainly a good alternative to driving, public transport, and walking and there are several places where you can rent a bike such as Vélib in which you can rent for just €1.70 for 1 day or €8 for 7 days.As for scooters, there are several Vespa tour companies who rent scooters and they usually start from €40 per person. By taxi or private car. Given the horrible traffic, I cannot recommend this as much. Also, taxis can get quite expensive _ but anyhow, if you want to, they usually have a €6.50 minimum fee on all taxi journeys (which is on top of your meter fare). If you need further help, just use the directions feature in Google Maps — I find this as a very helpful tool if I want to reach a certain place from a particular location. (However, Google Maps doesn’t work offline if you want routes or transportation schedules, so I recommend that you get a pocket WiFi (use promo code “IAMAILEEN” to save 15%) or a SIM Card to stay connected online). What are the best accommodation choices in Paris? A trip to one of the world’s most sought after destination — Paris — surely doesn’t have to be expensive. As you can see by now, if you’re into doing ‘budget travel’, there is no shortage of FREE things to do in Paris. It just takes some research and fortunately, I’ve already did that for you with the help of this article. So enjoy! Is Paris also on your travel bucket list? What activitiy in this list would you want to do first? Or have you been to Paris before? How was your trip? If you’re a local reading this article, do you have other suggestions to add? Or if you simply have other tips to tell, feel free to leave a comment! Thanks aileen, these helps alot on my planning. GOD BLESS! How long did you stay in France?